This report describes the post-college transitions of college graduates originally profiled in the highly discussed book Academically Adrift: Limited Learning on College Campuses (2011). Despite having successfully completed four-year colleges, the graduates in this ongoing study by the SSRC's Education Research Program (in collaboration with the Council for Aid to Education) are facing difficult school-to work transitions in today’s economic environment, struggling with significant financial burdens and employment challenges. Notably, we find that individual post-college experiences track with performance at the end of college on an evaluation of their higher-order generic skills measured with the Collegiate Learning Assessment (CLA). For more information, please visit http://highered.ssrc.org. 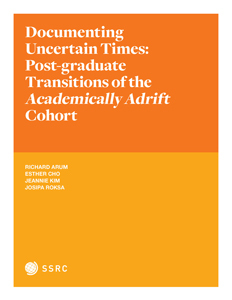 Arum, Richard, Cho, Esther, Kim, Jeannie and Roksa, Josipa, Documenting Uncertain Times: Post-graduate Transitions of the Academically Adrift Cohort (New York: Social Science Research Council, 2012).